Grey “yarn days” of January. A lull after the knitting frenzy (and posting frenzy) of December ! 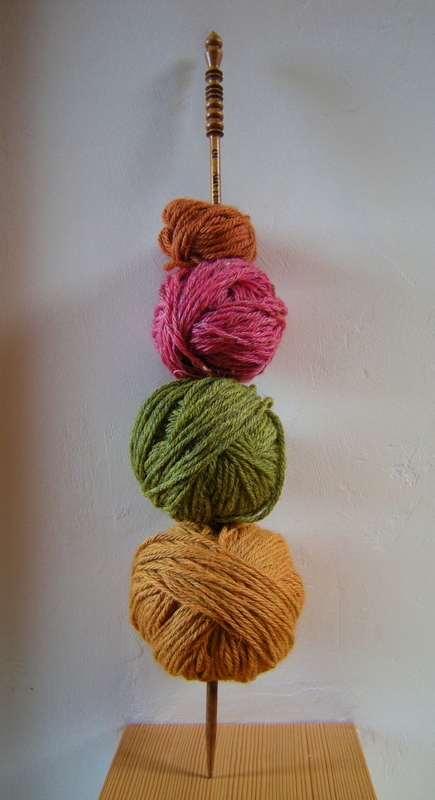 I’m having fun with balls of yarn about the house. Bathroom mirror blues . 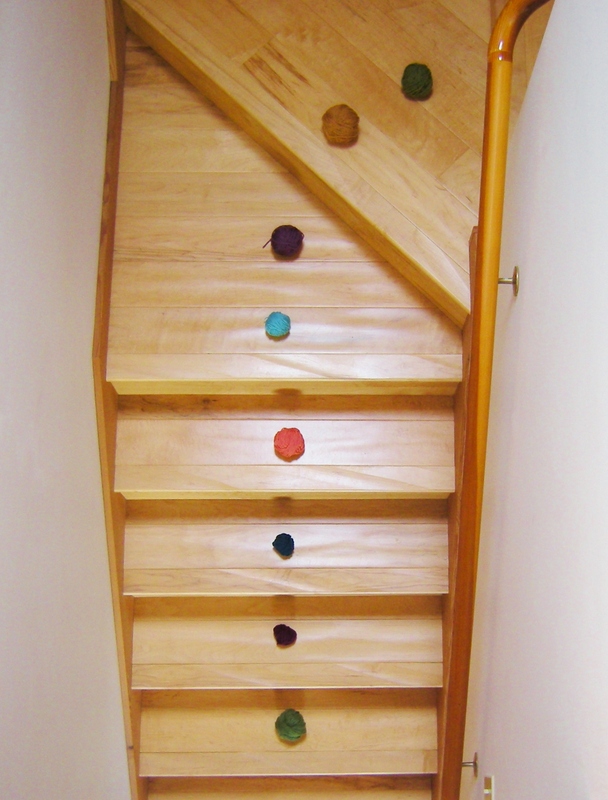 . .
Yarn steps . . . In the bed frame . . .
Another knitting needle yarn kebab . . .
Green . . . waiting for rain ! Having some fun today (being my birthday) photographing yarn. These will be fun new banners for Yarnings . . . I figured , well, it is just so artful, yarn in a sense of place. On the stairway landing half-wall where I photograph so much, on the stair steps themselves (a very favored personal trend) , and even precariously balanced on the iron rail which overlooks the lower part of our house, and all places which get a deal of light flooding from above via sky windows . And now Emma and I are going for a walk while I rattle off a few more fingers in Pretty Little Things gloves . . . prototypes which will be finished , photographed, and pattern ready soon! Jen! Your birthday! Have a great day and a great year! I love your jolly, playful pictures. They cheered up my day. Happy Birthday Darling Friend……Silly girl…..Playing with balls of yarn. Thank you Jen ! I know… TOTALLY SIlly huh ! I’m baking my cake (you know the one, what do I call it?? I forgot ! ) I”ll save you a piece ! Death by Chocolate?…..No, something better than that. Ooooo, love the pretty new pictures. I wish you a very Happy Birthday Jen! Cake? Did someone mention chocolate cake? Thank you Sarah… birthdays are a blink and hopefully nobody notices 🙂 But still, I am ‘finding that photographing yarn is so much fun !